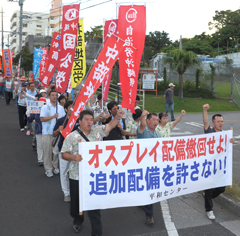 Marchers protest against the plan to deploy more Osprey to Futenma at Ginowan at 6:54 p.m. on July 5. 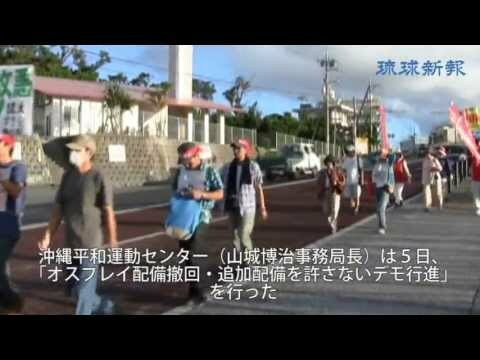 The Okinawa Peace Movement Center held a protest march on July 5 against the deployment of more Osprey to Okinawa, and has demanded the removal of the aircraft from the prefecture. About 60 people marched from Nodake Gate of U.S. Marine Corps Air Station Futenma in Ginowan to Ishihira Gate of Camp Foster in Kitanakagusuku. The U.S. military plans to place 12 more MV-22 Osprey aircraft to Futenma Air Station at the beginning of August. Shouting, “Do not allow the U.S. military to bring more Osprey to Okinawa,” the marchers protested against the U.S. and Japanese governments forcing through this plan. The center held the march to coincide with the protest action against stationing Osprey to Okinawa that they hold every Friday.